Notes From A Napkin in Shanghai- World Pipeline May 2017 | Cath-Tech Cathodic Technologies Ltd.
Elizabeth Nicholson, Matthew Bechberger and Patrick Yaremko of Cathodic Technology Ltd. Canada, review the process of developing a new cathodic protection survey instrument from concept to market. After a successful NACE conference in 2011, in a dimly lit Shanghai hotel lobby, Cathodic Technology Ltd (Cath-Tech) staff were talking with our distributors from Beijing, SANO Technologies (Sano). The discussion turned to new ideas when Sano said the magic words “Wouldn’t it be nice if?” As any equipment manufacturer will recognize, a demand or need is the first essential ingredient in any new product and the CorrReader was conceived. They wanted an easy to use cathodic protection data logger for performing routine test station surveys that would eliminate the need for hand written field notes, provide the pipeline operator with more accurate and detailed data and document when/where the readings were taken for regulatory compliance concerns. Notes were hastily made on cocktail napkins and other papers as the concept was thought out. A clear understanding of the customers’ data requirements, cost considerations and existing technologies available was given initial consideration. 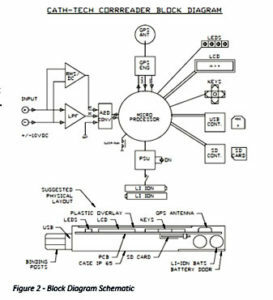 Being in the pipeline integrity instrumentation business for over 40 years, Cath-Tech had many of the basic principles and concepts already accounted for in some of our other products so the leap to a specialized automated handheld CP instrument was a natural fit. 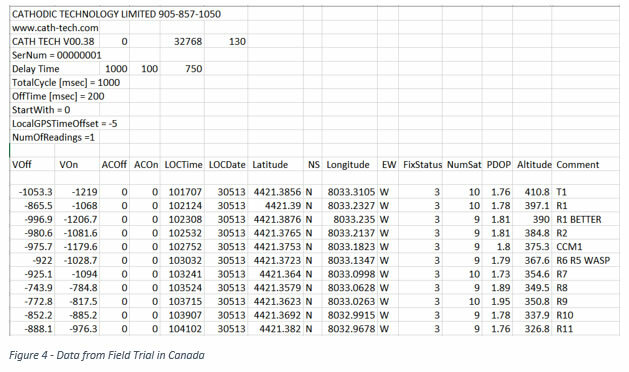 Around the world, pipelines are required to log critical CP data on a regular basis as part of their Pipeline Integrity Management Program. This includes complex surveys (CIPS, DCVG, Inline Inspection) and regular monitoring of rectifiers, bonds and test stations. The test station surveys are still being performed around the world with a regular digital volt meter (DVM), such as a Fluke, and a hand written note book. To improve this, the new instrument needed to be a purpose-built, handheld, outdoor device for performing regular test station surveys. It would be easy to use and acquire quality data by personnel with little to no training, so that local landowners, students and interns can easily perform these surveys. At the same time, the instrument needs to protect the settings the technician inputs, preventing an untrained user disrupting the records. 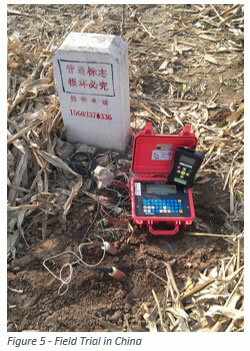 Low cost is also required to get the equipment into the hands of many surveyors simultaneously. By allowing many technicians to have an instrument of their own, travel costs for dedicated survey workers and shipping costs for equipment are reduced. Handwritten readings and notes can easily introduce human errors during recording of the data and later transcription to a computer file. Integrated electronic logging satisfies regulatory compliance requirements and ensures that precise location and time data are captured. Electronic files are much easier to transmit, copy to multiple recipients, store and backup securely. Utilizing commercially available MicroSD cards, the technician has the ability to simply swap the cards if a local computer for downloading is not available. The new instrument is programmed, charged and downloaded through a standard USB interface. The instrument is designed to perform interrupted or polarized surveys. Interrupting the source of cathodic protection on the structure allows the surveyor to measure the polarized potential. 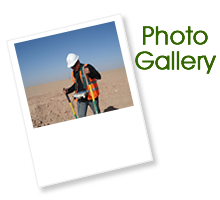 Without interruption, the surveyor reads both the pipeline potential and errors from any other potentials in the ground. If the survey is performed with a normal DVM readings are often inaccurate due to imprecise timing. During an interrupted survey, there can be leftover capacitance or inductance due to the length of pipe and the nature of the coating on it. This causes spikes in the pipe-to-soil potential that are included in the reading on a DVM. Modern close interval survey (CIS/CIPS) instruments improve the accuracy by using the GPS system to delay the reading to a moment in time when the potential has stabilized; thus recording an accurate pipe-to-soil potential. 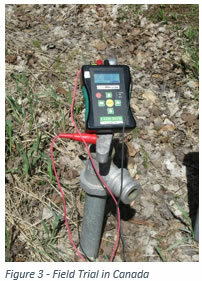 Another emerging factor in the management of pipeline integrity is the monitoring of AC interference. It has been proven that induced AC on structures can cause corrosion and failures. The instrument was designed to measure AC in addition to DC for each reading. Since the instrument is synchronized with the interruption cycle, it records separate OFF and ON readings. Survey systems (CIPS) are unable to measure AC accurately as the long trailing wire will pick up AC current through induction and distort any readings. The requirements above make the new instrument ideal to monitor AC at all test stations. By developing a purpose-built, easy to use instrument, these issues were addressed. The development team reviewed the requirements of NACE SP0207, section 4 and looked at other CP survey instruments to investigate what features are absolutely necessary to obtain accurate readings. The circuitry was designed with a 10MΩ input impedance and a -80dB AC filter to ensure that the DC reading is accurate with no imposed AC. It also uses an internal GPS module to synchronize with current interrupters and obtain the true OFF and ON potentials. User configured measurement delays also ensure that accurate readings are obtained by waiting for any inductive or capacitive spikes to clear prior to measurement. Finally, the ability to enter comments at the time of measurement makes it easy to identify and organize data during analysis. Cycle time: 1 second minimum, 6 minutes max. The CorrReader has integrated error-checking to ensure the user has configured the cycle ON/OFF times and delay times correctly. When the user presses the POWER button, the unit powers up, checks the settings, obtains the GPS signal, and begins to display voltage values without needing any additional action from the user. The user can then view the values in real time on the screen and press ENTER when they want to record the reading. After the reading is recorded to memory, the user has the option of entering any comments (location ID, etc.) using the arrow keys and on-screen keyboard. When in the field, the instrument records the following data. The data is stored in a plain text .csv file, making it easy to import into any pipeline information management database and is PODS compatible. No special software is required to compare the data from the CorrReader with previous surveys. The file header also contains information on the settings that were used to obtain the readings, such as cycle time and measurement delay, so the operator can ensure consistent data collection over time. The instrument was also designed to accept firmware updates, permitting upgrades to units already in the field. The CorrReader went through numerous tests in the lab and in the field prior to its commercial launch. Throughout development, the team worked closely with our production and field teams to confirm that the instrument was reading and recording accurately and to design for ease of production. Lab testing included AC rejection, filter settling time, battery consumption and GPS lock time. There were two main opportunities for field testing. One was local with Cath-Tech staff, the other was in China with Sano Technologies. Locally, Cath-Tech staff went in the off season to a local ski resort which uses cathodic protection to protect underground water and air pipes. This is an isolated system free of external influences with easy access to rectifiers and no hazardous product involved. Staff interrupted four rectifiers with a cycle of 200 milliseconds OFF, 800 milliseconds ON for a total cycle time of 1 second. Staff then walked along the pipelines and took readings at the snow machine hydrants. The instrument obtained a good GPS lock and recorded valid ON and OFF readings. A sample of the data is in Figure 4 below. Once Cath-Tech development staff were satisfied with the operation and accuracy of the instrument, units were sent to Sano in China for evaluation and testing. The testing yielded some successful data and highlighted further work to be done. Issues with certain cycle times were exposed that required modification to the software. The source of the problem turned out to be a software bug that would synchronize with the pulse per second from the GPS properly, but would not correctly locate the “top of the minute” to match the cycle patterns with the interrupters. This was easily resolved in the software after the correct diagnosis was made. A watertight (IP67) external USB port was also added based on the feedback. Finally, an option was added in the software to allow the technician configuring the instrument to override the measurement delay with their preferred value. If there is no delay value input, then the instrument calculates a value based on the OFF and ON cycle times. 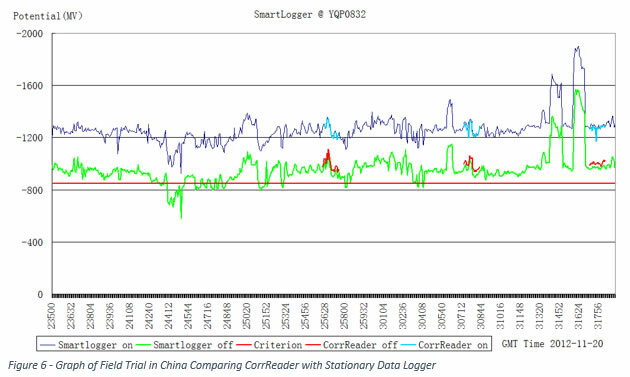 A sample of data from the Chinese test comparing the CorrReader with a GPS synchronized stationary data logger is shown in Figure 6 below. In order to keep the cost low, the development team also considered production challenges. Wherever possible, standardized off-the-shelf components were used, as this saves both time and cost. The electronics were designed to fit on one side of a printed circuit board and plug directly into the LCD screen. Minimizing the separate sub-assemblies and reducing custom components and wiring have made the assembly production more streamlined and efficient. Attention was also paid to the lifespan of the components chosen with a planned production life of 7 years. 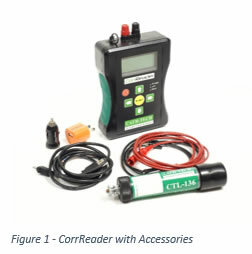 The CorrReader was submitted to an independent lab and tested for dust and water ingress. It successfully passed IP6X and IPX5 testing giving it a rating of IP65. It was also subjected to a 1m drop test, which it also passed. The CorrReader is a recipient of the 2017 NACE MP Corrosion Innovation of the Year Award. Since release on the market, many companies are successfully utilizing the CorrReader in their day-to-day pipeline monitoring. The combination of accurately timed readings and electronic recording of the data and GPS location is a significant improvement to record keeping. The integration of GPS and configurable delay times ensure that the reading is taken in synchronization with the interrupters and without any distortion from induction spikes. This is very important to obtain accurate instant OFF potentials, which can then be directly compared to data taken in a similar manner during a close interval survey. The CorrReader has also been useful to perform surveys in other situations. It can be used for tank surveys, inside stations and any other time accurate point CP measurements are needed. If the pipeline operator or government oversight auditor question the validity of the data, the surveyor can use it to prove that they were present at that site, and validate that company protocols were followed. With no data to hand record, or transcribe later into a database, a major source of human error is eliminated. This development project is an excellent example of international co-operation between a customer with a need in China and an instrument developer in Canada. By working together, a list of requirements was generated that accurately reflected a market need. After development, the field tests revealed some areas that required additional improvement. Those improvements contributed to the successful release of the instrument into the marketplace. Interesting ideas can start with a discussion at a conference and some scribbled notes on a napkin.